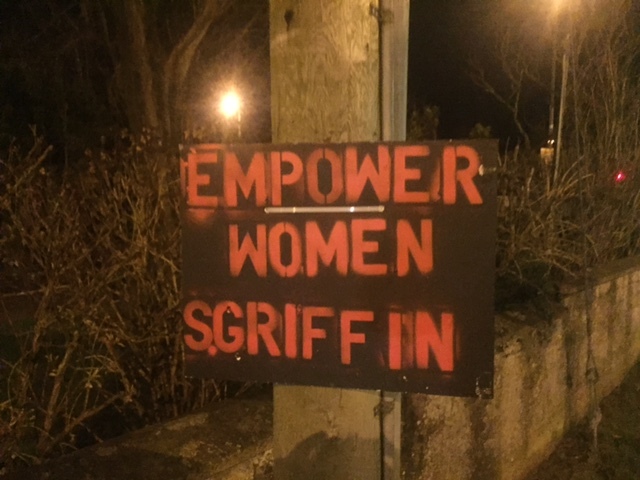 It’s that time again when we get the chance to shape how our country is run by either running for election or by choosing who we want to represent us in Dail Eireann. Even though I am quite interested in politics and have been living in my area for many years I can honestly say that I don’t know the first thing about pretty much any of the candidates. All manner of literature has been pushed through the letter box (most of this has been quite generic) and election posters decorate the lamp posts on most routes and in the housing estates. In less than a week I will be expected to cast my votes so between now and then I must make up my mind who I will give them to. As a business person I will want a pro-business candidate and I do believe that high taxes are a huge demotivator so I will also look for a sensible reduction in taxes. I personally hate the water charges but I detest even more the cohort who are protesting against them. I believe that everyone in society should be expected to work but that we should look after the elderly and the vulnerable. Finally we shouldn’t have a fear about getting sick in this fantastic country of ours. Once the politics align with my core beliefs and I believe in the candidate then they have my vote. Knowing the candidate – My first big observation as I note the different names appearing on the posters is that unlike other constituencies I know none of them except for one candidate! I find it is incredible that none of the candidates except for one has interacted with me in any way before the election – all candidates are therefore relying 100% on their posters, flyers, canvassing, advertising and late PR to convince me. 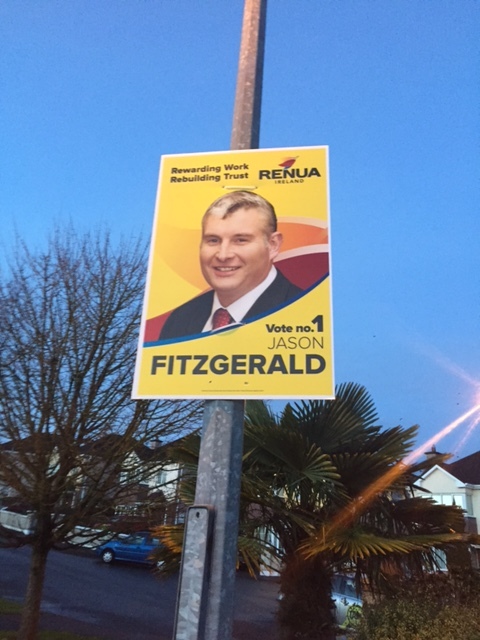 Professionalism – My second observation is the obvious professionalism and budget that Renua have with their campaign. This is a pre requisite for any party. Their large posters were the first up in the area and there is a huge quantity of them. This would make me consider them a little but the only problem once again is that I have absolutely no idea who Jason Fitzgerald is. Mickey Mouse – My third observation is how shocking some of the posters are. 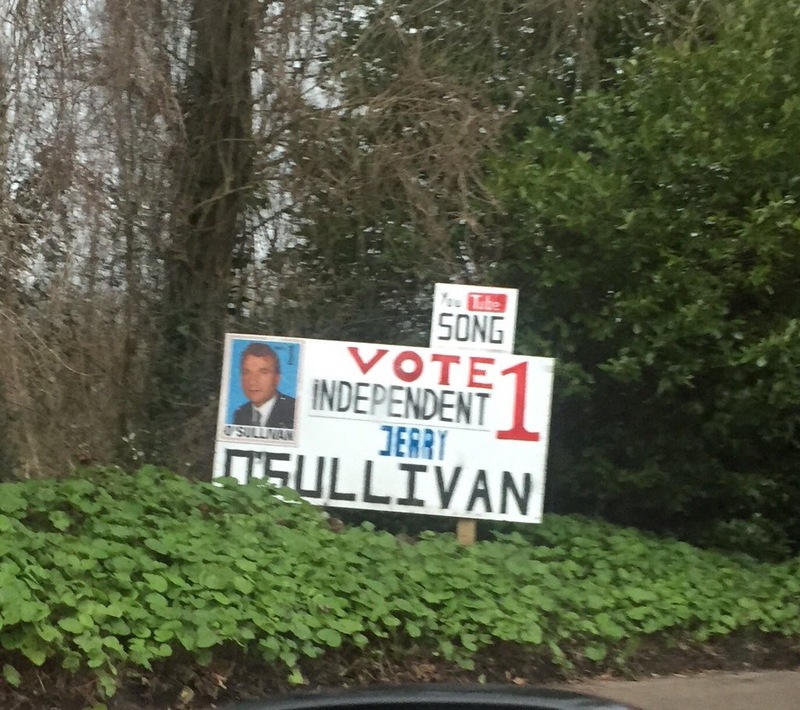 In my view poor candidate posters are a reflection of themselves and there is no way on earth you could even consider them as your representative. 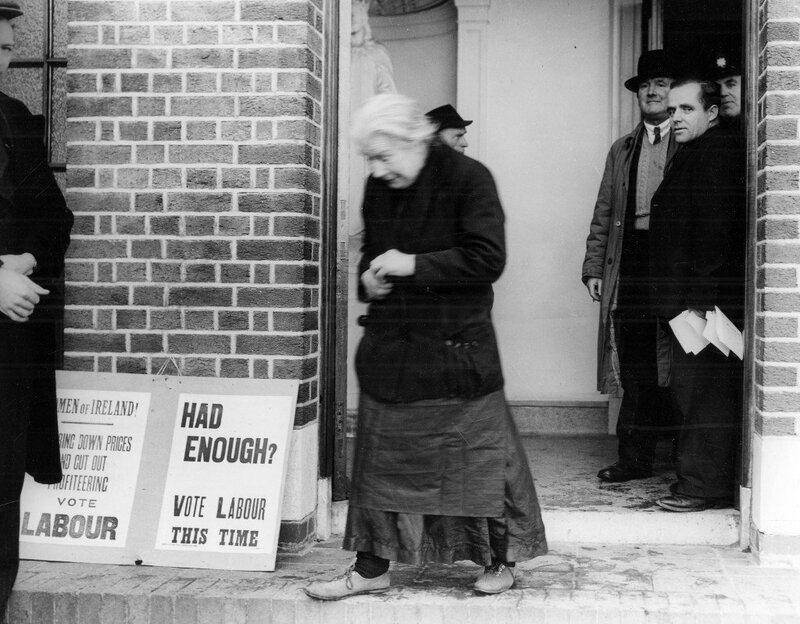 Shirley Griffin stands out with her second phase of posters, which look like a bunch of kids did them and even worse was Jerry O’Sullivan who definitely won the first prize for amateur hour. Both of these candidates make it very easy for me to dismiss them totally. Personal Bias – My fourth observation is the clear bias that I hold against certain parties and for that reason no poster, flyer or face to face canvass would sway my opinion in favour of them. 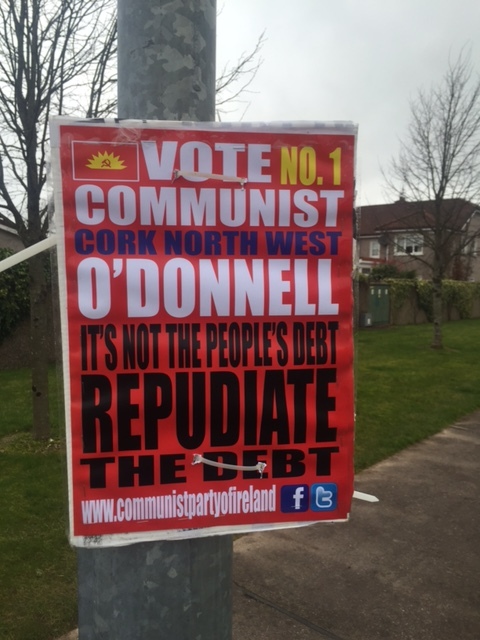 This for me puts a line through any Sinn Fein, Anti Austerity, People Against Profit or Communist Party candidates. Canvassing – My fifth observation is the power of canvassing. I found myself feeling quite positive towards a candidate I would not have considered beforehand due to the pleasant, coherent and polite manner of the person representing them. This surprised me as I always feel the candidate is the person you should meet. Like many people I am very slow to open the door these days so I suspect this may not be as effective as it used be. Party Performance – My sixth observation is the power of the TV debates and all the discussion before and after these. Not only do the media evaluate the performance of the parties in detail but it is also becomes a popular topic with people you deal with on an everyday basis. A strong TV performance for a Party leader will quite possibly have you looking favorably on the local Party candidate who you have never heard of before and vice versa. While I disagree with the high taxation philosophy of the Social Democrats I believe Stephen Donnelly’s TV performances could sway votes for candidates around the country. In our constituency there is no candidate so all his hard work is a waste this time round! Social Media – My seventh observation was how invisible most of the candidates in our constituency were during the campaign and during the last few years. Guys…wake up!!! This is a lot easier than shoe leather and attending endless funerals and is a very effective way of reaching large numbers of voters. Nothing Changes – My eight and last observation (phew you say!) is that while everything has changed, in many ways nothing has changed and the job of chasing votes is pretty similar to how it always has been. When I was a kid, I used live across the road from a school that was one of the polling stations. I remember vividly the excitement around voting day and the build up. We were fascinated by the colourful posters and I even remember bringing one home with me. On the day of the elections we used help the guys to hand out last minute flyers for the candidates – I’m sure we earned the odd chocolate bar for our extreme efforts. Last week while walking “Honey” (the dog, who has since run away again for the third time!) 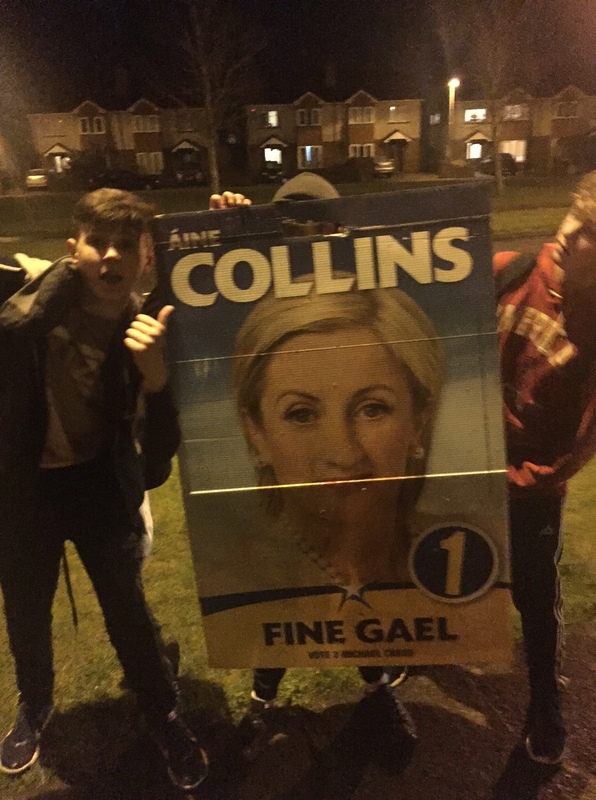 late at night we came across a bunch of kids on their mid-term break who were marching around with an Aine Collins poster. They even stopped so we could photograph them with their favourite politician! As it turns out Aine Collins, our Fine Gael TD is my favourite as well and she will be getting my No 1. Vote. She is the one that I have got to know quite well over the years and in my view is an intelligent, straight forward, honest, hard working politician who has made a big difference both locally and nationally on quite a number of issues. She will be the first to admit that things aren’t perfect but I do trust her when she tells me she will try her best to improve them. I sincerely believe that campaigning is a very tough, expensive and exhausting job and I would genuinely congratulate and thank all of the candidates for putting themselves forward and letting us judge them on the 26th February. What factors are swaying you this time round? This entry was posted on February 21, 2016 at 10:43 am and is filed under General Election 2011, General Elections, Irish Politics, Personal Marketing, Politics. You can follow any responses to this entry through the RSS 2.0 feed. You can leave a response, or trackback from your own site. Now Greg, pardon my cynicism, while we each have our own school of thought on this election campaign (and you were right 8 points later) it was quite an amount of information to sift through on one person’s view points. But does this not smack a little of clever endorsement disguised in a nostalgic blog post? Granted, all the points on candidate engagment with their consituency is taken on board, a poster campaign run by a team of three year olds probably isn’t the way forward and accepting the costs involved. And, while I’m not familiar with all of the candidates within my own constituency, (disappointed to say the least nobody knocked on my door) let’s just call a spade a spade, you obviously believe that Fianna Gael in all its apparent disastrous time in office is still the way forward. If Áine Collins is such a great candidate, whom you believe can make a difference, (and I say this knowing none of her past accomplishments) then why is she prepared to saddle herself with a sinking ship instead of opting to gather a new cohort to create a “New Political Party” This would have been top of my wish list. An emerging group of dynamic individuals who come from both the private corporate sector and those with a proven governmental track record uniting. Unfortunately this won’t happen. Possibly, because of vested interests or the fear of being blacklisted. We just regurgitate the same political figures time and again. I find it very hard to believe any politician worth their salt would claim to want to represent a party which has ravaged this country of both its people and economy while insisting they show integrity and belief in what it stands for. Thanks Natasha for reading my long and winding post … it took way too long to write. I was sorry I started it but was determined to finish. Based on the conversation in the office today you have captured a similar sentiment in your post – FG/Labour are being blamed: (I will use your words here) “a party which has ravaged this country of both its people and economy while insisting they show integrity and belief in what it stands for”. As a communications person I must conclude that the current government have failed miserably in communicating their successes and failed even more in managing some of the painful things they had to implement and oversee. The opposition are having a field day at the moment exploiting the ‘soft ground’ around all of this. 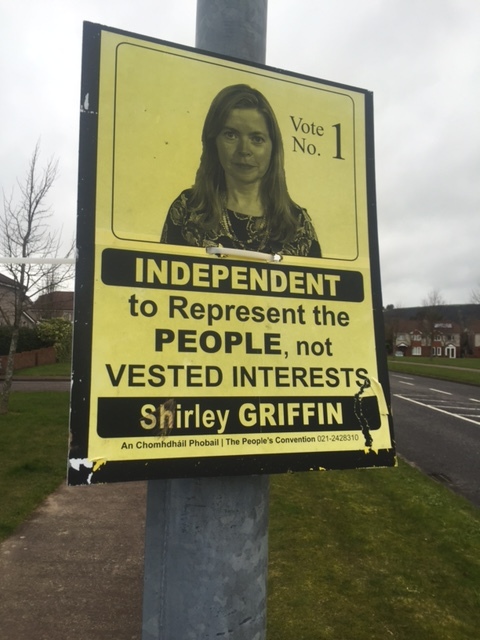 In my constituency I think we have really poor candidates and Aine is the stand out one for me. I believe she is all of the things I said she was – I am very disappointed that I don’t have another option, which is a huge problem. Maybe I should have mobilised someone I believed in instead of complaining about it? My personal opinion is that FG/Labour have done quite a good job in awful circumstances and in the total absence of a better proposition I will hope that this work can be continued.